29. This type of mooring achieves its holding power through anchors embedded in the seafloor. These anchors are connected to ground leg chains that meet at the ground ring which, in turn, is connected to a riser-type buoy by a riser chain. 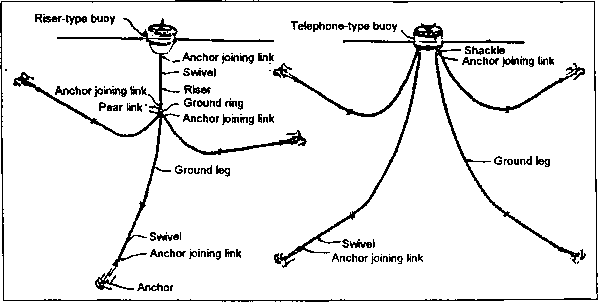 Another fleet mooring is the nonriser free-swinging mooring (previously called telephone), illustrated in Figure 3-30. This configuration uses anchors embedded in the seafloor that are individually connected to a telephone buoy. Both riser and nonriser moorings require a good deal of unobstructed water surface to allow the ship to rotate around the mooring according to changes in wind and current direction. 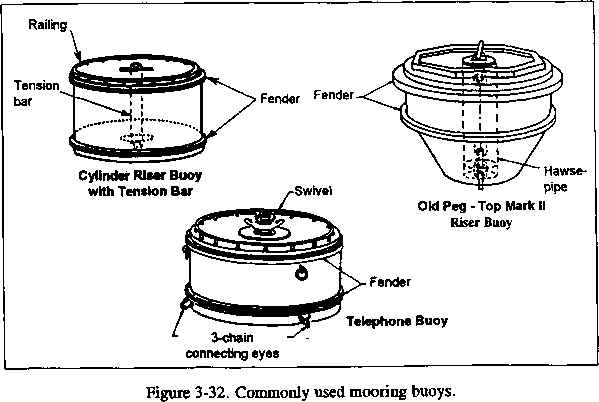 Figure 3-31 illustrates a spread mooring with three mooring buoys. A spread mooring eliminates the tendency for the buoy to rotate. This type of mooring uses two or more mooring buoys, usually in conjunction with the ship's anchors, to hold the ship in a fixed position. The most commonly used types of buoys are illustrated in Figure 3-32 and fleet mooring hardware components are illustrated in Figure 3-33. • Drag Embedment Anchors. Common drag embedment anchor types found in Navy moorings are shown in Figure 3-35. Of these anchor types, the NAVMOOR anchor is typically found in high capacity moorings (Class C - 100,000 pounds and above); while the stabilized Stockless anchor is used in moderate to low capacity moorings (Class C or below). Stockless anchor flukes will be fixed in the fully-opened position for mud soil applications. 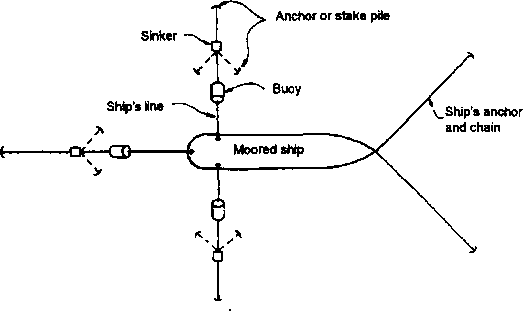 When mooring load in a ground leg exceeds the capacity of a single anchor, multiple anchors are used side by side or in tandem (piggyback). 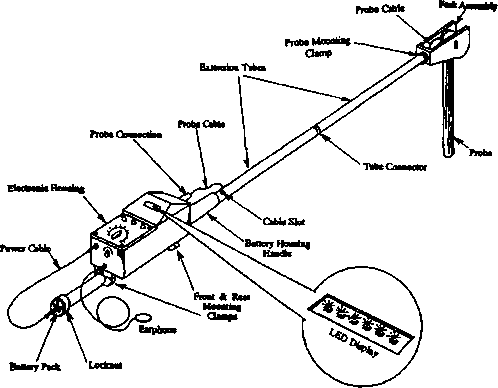 The ground leg options are shown in Figure 3-36. In mud seafloors, the piggyback and connecting chain will be buried. However, in hard clay and sand seafloors, the connecting chain and hardware will be exposed and available for inspection. • Wedge Anchor (Pearl Harbor Anchor). This inexpensive anchor may be found in low capacity and short-scope moorings in single and multiple anchor ground legs. Both primary and tandem chain connections and tandem chain often are exposed on the bottom and thus are available for inspection. For rock seafloors, this anchor may be fitted with steel digging plates on the front anchor face, which may be worn or damaged and should be inspected. Riser free-swing fleet mooring. Nonriser free-swinging fleet mooring. Figure 3-31. Typical spread mooring.